Testimony from former members of Maj. Witt’s unit, the 446th Aeromedical Evacuation Squadron, filled the third day of the trial. Leading off was Jill Robinson, who spent 23 years in the Air Force. Inspiring her service was a recruiting poster for the Air Force Reserves that featured Maj. Witt on the cover. Robinson testified that she saw Maj. Witt as a mentor in the 446th, and that her discharge was like “extracting a parent from the family.” Robinson said she found the entire process “crude” and unfair. The day’s second witness was Heidi Smidt, who testified that upon hearing of Maj. Witt’s initial suspension, her immediate thoughts were that “the loss of Witt was devastating to the Air Force and to the unit.” She believed that the “squadron (was) losing a very valuable member.” Read her written Declaration. Former flight nurse Judith Krill, the next witness, served as a unit deployment manager in the 446th. In this position Krill observed families separating as service members left for deployment. Krill testified that at these departures she saw heterosexual couples and gay and lesbian “roommates” alike separating with the same emotions. Krill said she was horrified to learn that Maj. Witt had been discharged because she “was the epitome of what you want (crew members) to be.” Read her written Declaration. Since 1993, more than 13,000 service members have been discharged due to their sexual orientation. At least 240 of those service members have been discharged since President Obama took office. The Senate will debate DADT as early as next week. 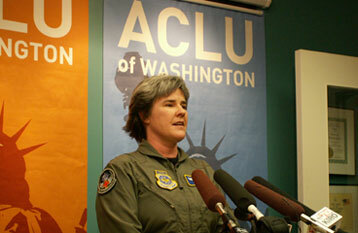 Join the ACLU in urging Congress to act this year to finally end DADT once and for all.